There are a variety of insurance companies providing all types of plans. Some provide most of these plan types, while many also offer multiple variations within each type. This makes choosing a particular Medicare Advantage plan a somewhat tricky task; it can become very confusing. 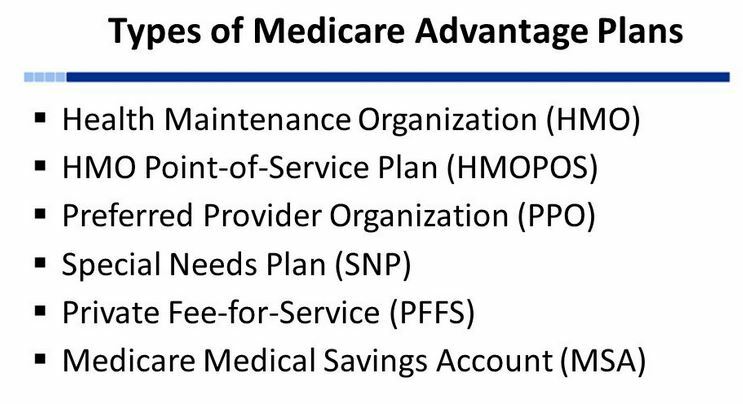 HMO and PPO are the most popular plan types of Medicare Advantage plans because people find them to be most suitable for their needs. Table 1 below summarizes their features. Table 2 summarizes the features of other plan types. How Can Liberty Medicare Help? We represent carriers with all types of Medicare Advantage plans: not only the familiar HMO and PPO plans but the less known Special Needs Plans (SNPs) and Medicare Savings Accounts Plans (MSA) as well. Special Needs Plans (SNPs) are for people having specific chronic conditions (like diabetes, congestive heart failure, or a mental health condition), living in an institution (like a nursing home), or having both Medicare and Medicaid. The plans are tailored to the needs of the groups they serve. Medicare Savings Account Plans (MSA) do not require the use of a network of medical providers. The beneficiary can go to any doctor or medical facility that accepts Medicare and the insurance carrier’s terms and conditions of payment. Liberty Medicare represents many well-known Medicare Advantage providers doing business in Delaware, Illinois, Maryland, New Jersey, New York, Ohio, Pennsylvania, and Virginia. Learn more about all the benefits of working with Liberty Medicare. All of our services are offered to you at no cost. To observe real quotes from Medicare Advantage providers, please fill out our Medicare Advantage Quote form. You also may give us a call at 877-657-7477, and you will be connected to a licensed agent/broker.